Pours out of the bottle to a golden color with a nice 3/4” head. Smells much more floral than fruity, some lacing. I found this to be a refreshingly different beer. It feels and tastes initially clean with a floral aftertaste. I have bought several six-packs of this. It is a solid, but not great beer. I'll describe it: Sort of a cream ale style beer. I am unable to discern any "fruit and a floral" hops as they mention on the label. Doesn't really come through. Crisp, decent bitterness and body. Definitely not a bad beer by any means. Light in color. The aroma is an apricot smell. The taste is apricot as well. I was also able to taste a hint of cherry in there as well. Others I know have commented that as well, but then others do not taste the cherry flavor. I like this beer though. Has that fruit flavor, but it is not overpowering by any means. That is good for me because I am not a fan of super fruity bears. Goes down pretty smooth, even if you are not a huge fan apricots (which I am not). Would recommend this to someone, but at the same time would not go out of my way to by this from a huge selection most likely. Can’t believe the low ratings here. It is a unique floraly taste but very delightful. Not real hoppy so that may be the reason but a solid tasteful PA. Medium light body with a very mild aroma. Theres apricot, some grass, and malt but aroma is mostly apricot. Taste is a little dry, as well as tasting like dried apricots and just a bit sweet. When I opened the bottle, the beer smelled bad, like it was old. The taste was bitter . 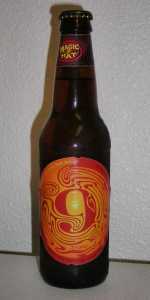 I liked all the other Magic Hat beers I have tried but this one was a real disappointment. Pours to a cooper hue, but head and lacing disappear to quickly. Has an interesting, musty aroma and a crisp, fruity flavor. My original recollection of this beer was more positive than what I think right now. Been around for a good bit, I have had it a few times on and off. I like it ok, it's slightly above my average which is 3.0. Good, just not special.